Stampings Division is in the field of manufacturing and supply of sheet metal components and CNC machined parts for OEM automobile suppliers to the automotive manufacturers in India. With CNC Machining, Fabrication, CNC Grinding, Wire EDM and secondary support presses, WMPI can be a single source for your assembly and sub-assembly need. 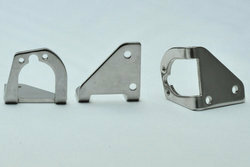 Looking for Custom Metal Stamping Services ?